Trains & Things was founded in 1977, but our roots go far deeper than our grand opening all those decades ago. 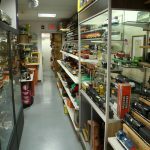 Today, we welcome hobbyists and model train enthusiasts of all types, taking any chance we get to share our love of model trains with visitors to our store. 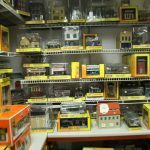 Owner Tony Chiarello began receiving model train sets from his father when he was a young boy. Working on the railroad, Tony’s father developed a fascination with trains and began collecting his favorites as scale models. Tony developed his own love of trains through these models and, for more than 40 years, grew the collection his father had started. 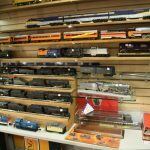 The idea for Trains & Things grew from a hobby into a business in 1977, when Tony began opening his collection up to other hobbyists. 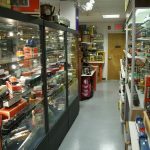 Soon, it grew out of the basement and into the garage, eventually becoming so large and popular in the model train community that Tony moved the business to its first storefront location. In 1992, Trains & Things officially opened in the Glen Roc Shopping Center. Since that initial storefront, the business has relocated several times to accommodate its growth and patronage. Unfortunately, not every move was a good one. In 2006, a shopping center fire completely destroyed the business, forcing Tony to rebuild from the ground up. Thankfully, through his many connections and friendships within the model train community, Tony was able to get Trains & Things back on its feet. Today, Trains & Things sits in its final home. The business is run by Tony—now retired from his job of 47 years with the Coleman Auto Group—his daughter Krissy, son Anthony, and the Chiarello family dog, Nicholas. Tony’s all-time favorite model train is the Pennsylvania GG1—also known as “The Congressional.” It’s a train he has seen many times in real-life. 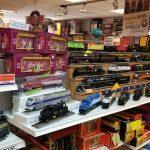 Trains & Things welcomes everyone! In fact, we have a number of children with autism who visit on a regular basis, who love to watch the trains! We have customers from around the world, including Norway! We’ve traveled around the region setting up train displays for special events and exhibits, including Bordentown’s annual Old City Hall Holiday Model Train Show. Our model trains and displays have been featured on shows like Good Morning, America. Visit us today and experience the joys of model trains for yourself! Tony, Krissy, Anthony, and Nicholas welcome you!